Using Paint Shop Pro: Select a 60x60 area of a source image, the source image can be a photograph or a texture you've created yourself. Once selected choose "Selections" -- "Convert to Seamless Pattern" in the menu, this will create a new image that is supposed to be a seamless tiling pattern. Note: Alternatively, you can select any size rectangular region IF you take into account the information discussed in the "Color Depth & Resizing" section of this tutorial. The region you select should have similar characteristics on the opposite edges of the selection, if it does not then the resulting borders will not merge into seamlessness in a convincing way. The region you select needs to be well away from the borders of the entire image, if it's not then PSP will complain. If necessary, just add border space to your source image using the "add borders" feature. Using a large photograph of a cabin with a field of flowers in front of it as a source, I decided to zoom into the flower field and select a 60x60 region of it for "conversion to a seamless pattern". I chose this as a seamless candidate because the flowers are already quite uniform, making it easy to blend opposite edges of the selection into seamlessness. Upon testing this new seamless pattern I discovered it had some visible seams, when you create a new seamless pattern be sure to test it to make sure it shows no such hard edges when tiled. Simply start a new large image, select the fill tool, set the pattern fill to your new seamless pattern and fill the new image. Zoom in and see if there are visible lines in the tiling pattern. If your fill texture is truly seamless then save it, if it needs repairing then follow the procedure described next. 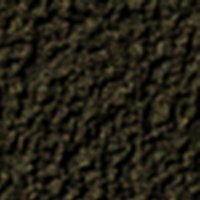 "Copy" your current 60x60 "seamless" texture to the clipboard. Start a new 60x60 image. Paste your pattern into it as a floating selection or layer, positioning one of it's corners somewhere near the center of the new image, then paste another one in, move it opposite of the first one and align the corners precisely, as pictured below. The before image depicts the lines I saw when I first tested my seamless texture by using it in a fill. If you look carefully at the area of the cross section and particularly at the center where all four corners meet, you should see there is a visible line where the textures edges did not perfectly blend. To repair this flaw just select the "soften" tool and set it to 3 pixels, with a hardness and density of 25%. Gently stroke away the visible lines seen in the cross section, blending them just enough to make them disappear. 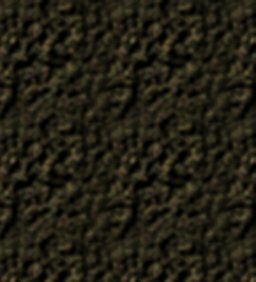 You should now have a perfect seamless texture, as pictured in the after image. Test it as a fill texture if you like and then be sure to save it. Admittedly, this example depicts a very faint non-aligning edge, but even one this faint will become noticable in your finished composite textures, so please do take the time to make your source textures perfect. 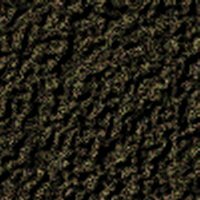 Ideally, this tiling verification technique should be used on all source textures you choose to use, especially if they have been resized. 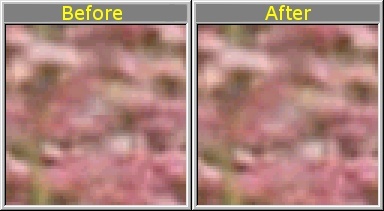 In the absence of the PSP seamless pattern feature you can use this edge shifting technique to see and then blend your edges manually with your paint program's retouch tools. 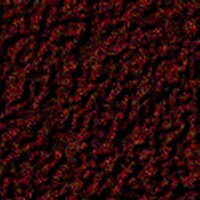 Creating original seamless patterns: I now present a step by step guide for Paint Shop Pro 6, you will need to adapt these steps for other versions or other programs but hopefully the basic concepts will become apparent, all of these steps are not required - they simply represent some of the possibilities of layering effects on one another for the purpose of creating textures. 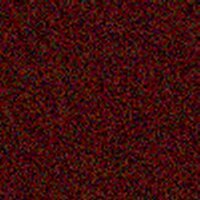 Begin a new 400x400 image as this will be a comfortable size to work with, then fill it with the solid color of your choice, I chose a standard red-brown color. Next, add "Noise". In the menu choose "Image" -- "Noise" --"Add". When the dialog box is up just play with the values until you've got something you like, in this example I used "uniform" noise at "38%". Next, apply a "Texture" effect. In the menu choose "Image" --"Effects" -- "Texture". When the texture dialog box is up just play with all the variables until you've got something you like. Next, adjust the "color" to something more to your liking, in this case I'm going for something more earthlike. In the menu select "Colors" -- "Adjust" -- "Hue/Saturation/Lightness" and play with the sliders until you like the result. In this case I raised the Hue by 12, lowered the saturation by 65 and raised the lightness by 30. Next, soften or blur the image to get rid of hard pixels. In the menu I selected "Image" -- "Blur" -- "Soften". Next, select a 60x60 area somewhere in the central area of the image. Once selected choose "Selections" -- "Convert to Seamless Pattern" in the menu, this will create a new image that is supposed to be a seamless tiling pattern (pictured at left). Test your new seamless pattern to make sure it shows no hard borders when tiled. Simply start a new 400x400 image, select the fill tool, set the pattern fill to your new seamless pattern and fill the new image. Zoom in and see if there are visible lines in the tiling pattern. If your fill texture is truly seamless then save it, if it needs repairing then follow the procedure described in the previous section on this page.